Bulgaria for Citizens, the party founded by former Bulgarian European Commissioner Meglena Kuneva, is to elect its new leadership on September 21, it has been announced. 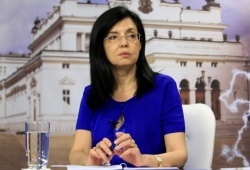 Bulgaria for Citizens’ leadership resigned collectively after the party failed to overcome the 4% election threshold and enter Parliament at the elections in May. At its annual sitting on September 21, the party will also discuss its future within the recently established Reformist Bloc, a formation of mainly right-wing parties that strongly supports the ongoing anti-government protests in the country.